If, like me, you can’t cross the Pond to see the current Vanessa Bell exhibit at London’s Dulwich Picture Gallery, get a glimpse of what you’re missing online. Listen to the BBC Radio 4 Woman’s Hour interview with Virginia Nicholson as she talks about her grandmother’s work and shares her fascinating reminisces about her experiences with Vanessa. Just click on “Vanessa Bell” in the horizontal bar above the time bar. Visit Legacy: Photographs by Vanessa Bell and Patti Smith, a special display that brings together photographs by Vanessa Bell and the American writer, artist and musician, Patti Smith. Shop for Vanessa Bell inspired items at the Dulwich Picture Gallery online shop. I just did and found that shipping costs weren’t too prohibitive. 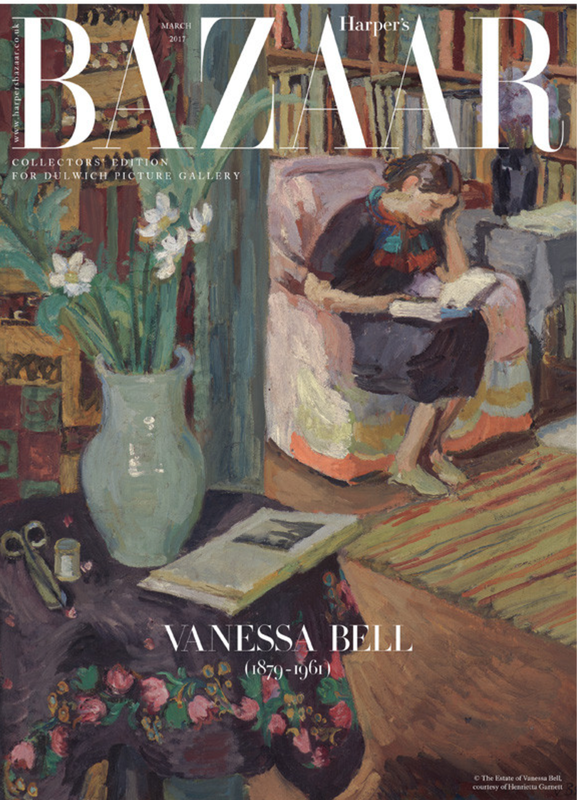 You’ll find books, tea things, pillow shams, art and a collector’s edition of Harper’s Bazaar that features a Bell painting on the cover. Read reviews from The Evening Standard and The Telegraph. Not sure I’m going to make it this weekend, but I’ve ordered TONS from the gift shop and the poster arrived today!